Each of these thick, delicious hot sauces contain a different chile-liquor pairing for complex flavor power. Each of these three hot sauces offers a different chile and alcohol pairing. Mango Bourbon blends toasty, oaky, caramel Kentucky bourbon and mango's sweet, tropical flavor. Habanero Moonshine combines the super-hot fruitiness of habanero with the mule-kick of real moonshine. Jalapeño Tequila blends the signature, dry, herbal-floral taste of tequila with the fresh, summery taste of jalapeño. 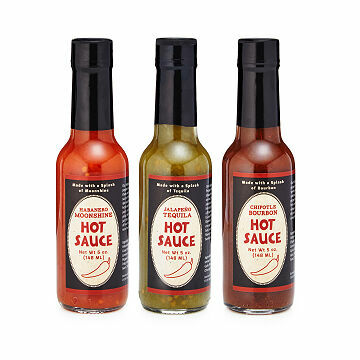 All three are made with crushed peppers with no sugar added, and are much thicker than most hot sauces. Sauces contain no alcohol. Made in Virginia. This trio has been updated to include Mango Bourbon Hot Sauce in place of Chipotle Bourbon. Great gift when looking for something a little different. A friend of mine enjoys hot sauces and drinking, so a great combination. This has been a creative was to improve the sandwiches and items on the grill! I bought this for my brothers-in-law. He loves hot sauce and booze so this was perfect! Sauces are good on everything! Great variety of boozy takes on hot sauce for any spice lover! This was a gift for my boss who is difficult to buy for. He loves hot sauce and really enjoyed this gift. For my husband's birthday, I always try to look for something a little different that he would never think to buy for himself. When I found this, I thought "alcohol and hot sauce = 2 of my husband's favorite things". It did not disappoint. He loves all 3 and says he has to be careful or he will use it all in a day. Habanero Moonshine is the best! The hot sauce has been used on burritos, burgers, breakfasts etc and it is delicious!